16. Owen, Richard (1804-1892). “Contribution to the natural history of the anthropoid apes, no. VIII”. Transactions of the Zoological Society of London, 1866, 5:243-??? 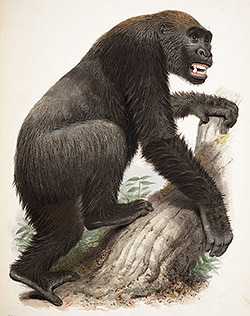 Richard Owen, the foremost comparative anatomist in Great Britain, published eight papers on the anthropoid apes in these Transactions, including three on the gorilla, of which this was the last. He worked from the material brought back by Du Chaillu from Gabon (see item 15). 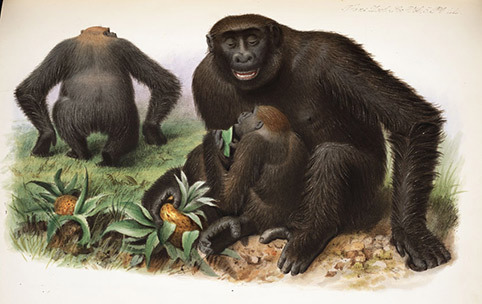 This lithograph of a gorilla family was drawn by Joseph Wolf, the foremost zoological illustrator of the decade, who also worked from the skins collected by Du Chaillu; Wolf had not seen a live specimen. It is of interest that the male gorilla is portrayed here, not as a killer, but as a family patriarch.